Having installed a site with the latest versions of Drupal8 and CiviCRM, I connected it to a shared CiviCRM database. I followed the "full manual process" of David Snopek to successfully install Drupal 8.6.4 & CiviCRM 5.8.2 ! Then I used the advices of Jon G. on how to separate the Drupal 8 database from my CiviCRM database. These were great positive steps but very fast, I run into issues concerning the Navigation and several Extensions. Concerning the Navigation issue the menu items are shown in a wrong alignement and they are not clicable. The Shoreditch extension is ON but it could not not seen in the CiviCRM settings for the Resource URLs (civicrm/admin/setting/url?reset=1). I manually did set the path. On one page there is a missing image with this warning : "civicrm Forbidden You don't have permission to access /vendor/civicrm/civicrm-core/i/Inform.gif on this server." Can this be a clue ? Symfony\Component\DependencyInjection\Exception\InvalidArgumentException: Unable to parse file "PATH/sites/default/files/civicrm/ext/org.civicrm.api4/services.xml". in Symfony\Component\DependencyInjection\Loader\XmlFileLoader->parseFileToDOM() (line 386 of PATH/vendor/symfony/dependency-injection/Loader/XmlFileLoader.php). This clarify the question about the position of the vendor file. Your point of view make great sense. It seems to be a more clean organisation and for the security reasons that you mentioned also, I do agree. So I will then withdraw from this direction where vendor was webroot-accessible to go forward with symlinking the vendor directory into the webroot. But when I follow the process, and at the very beginning of your Drupal 8/CiviCRM notes, with the Civi 5.8.2 there is an Error : our requirements could not be resolved to an installable set of packages. I do not recall this error when I use the (a) method (vendor in the webroot). 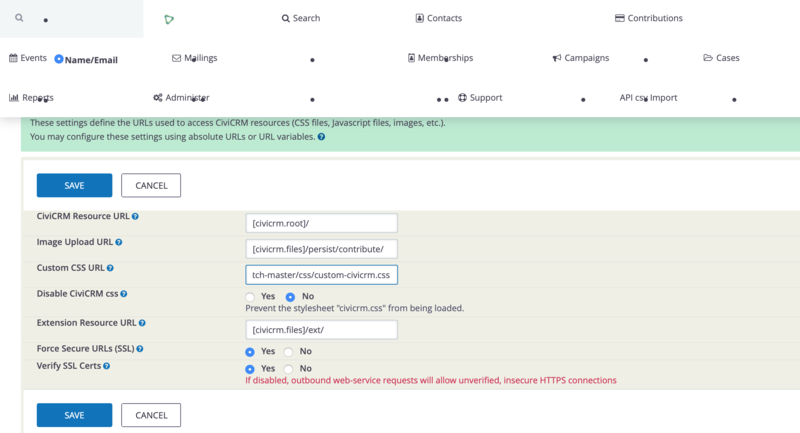 But when I follow the process, and at the very beginning of your Drupal 8/CiviCRM notes, with the Civi 5.8.2 there is an Error : our requirements could not be resolved to an installable set of packages. I do not recall this error when I use the (a) method (vendor in the webroot). -> satisfiable by psr/log[1.0.0, 1.0.1, 1.0.2]. Is this a setting only that I can change in the json file of the Composer ? Can I change the composer repository to access to the Civi 9-beta ? In case, of course, that the Civi 9.0 handle civicrm/civicrm-cxn-rpc ~0.17.07.01. is handled now. After the several advices of Jon (Thanks a lot ;-) I could complete the install of CiviCRM 5.8.2 which is now OK with Drupal 8.6.4 ! Thank you so much David Snopek for your work and Jon G. for your great help ! There are multiple conflicting methods of installing CiviCRM with Drupal 8. It sounds like you're either a) placing the vendor directory into your webroot, or b) symlinking the vendor directory into your webroot. The lack of definitive instructions for D8/Civi is frustrating. However (for security reasons) I believe the community won't accept a solution where vendor is webroot-accessible, which the "dsnopek full manual process" does. Note that David Snopek does NOT use that approach himself anymore! Here are my Drupal 8/CiviCRM notes. Instead of installing vendor in webroot, I copy the JS/CSS/etc. resources only into a web-accessible directory. Pay particular attention to the last bullet point; manually setting paths in civicrm.settings.php is almost certainly the solution here for Shoreditch. Also note Shoreditch has another problem in D8 that breaks QuickSearch, but it's fixed in Civi 5.9+. You can backport the fix to 5.8 or upgrade to 5.9 next week (January 2nd 2019). As for APIv4, there's a breaking incompatibility between the Symfony version it wants and Drupal 8. Contact Layout Editor is off the table until that's fixed. This requires that CiviCRM be upgraded to Symfony 3+. With regard to the issue posted in your update: There's a dependency conflict between CiviCRM and some other component you have installed over which version of psr/log should be installed. Both civicrm-core and civicrm-cxn-rpc specify psr/log ~1.0.0 which means "any version starting with 1.0". You have another package that's specifying psr/log 1.1.0. I couldn't tell you which one, though you could probably figure it out by searching your composer.lock file. psr/log 1.1.0 is pretty new - about 5 weeks old. I just opened an issue for CiviCRM to support it. My guess is that it works just fine, it just needs the composer.json updated. There's probably a way to tell composer to accept the newer psr/log but I don't know it. Hopefully someone else will chime in with the quick workaround! Not the answer you're looking for? Browse other questions tagged drupal multisite shoreditch symfony contact-layout-editor or ask your own question.